First released in 1980, Raymond Briggs’s Gentleman Jim isn’t just one of the first graphic novels ever published in English. It’s also the gently funny and sad story of Jim and Hilda Bloggs, who dream of a better life, even though they never went to school or got the Levels. As Gentleman Jim’s mind wanders to the lives he could lead, Raymond Briggs’s ahead-of-its-time storytelling takes us along for the ride. 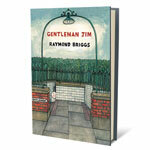 Gentleman Jim is being republished this month in a handsome new edition by Drawn & Quarterly.